This is probably normal for most of these folks, I thought wryly as Katie and I made our way under a slate gray sky toward the start line for the 2015 Mountains 2 Beach Marathon. They’re hard-wired for 6:00am track workouts and 5:00am long runs. 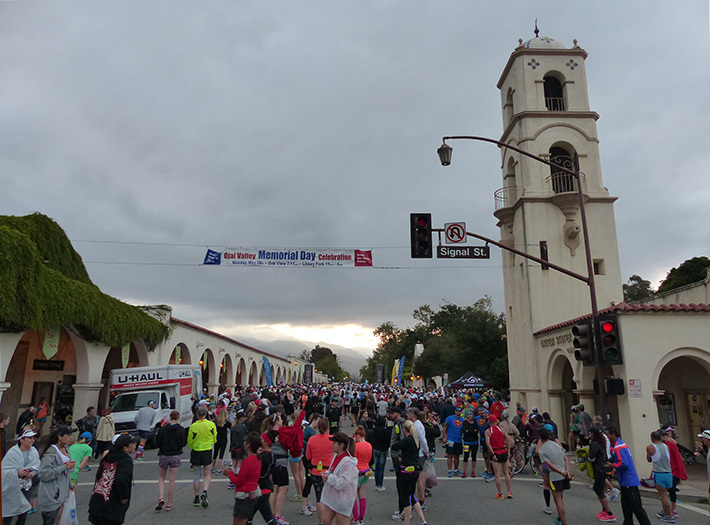 With the official start time of 6:00am just minutes away, restless runners milled around what I had to believe was Ojai’s downtown district. The muted light of a cloud-covered sunrise gently caressed the Spanish-influenced Post Office Bell Tower, whose four-story stature dominated the Ojai “skyline”. The familiar bounce of “Happy” – these days the go-to musical stimulant of race organizers – diffused at low volume over the gathering throng. At the same time my own stimulant of choice, the 5-Hour Energy coursing through my bloodstream, kicked in bringing with it a moment of clarity: this was damn early to be running a marathon. Unlike most runners I’m predisposed to the Dark Side, meaning I’m a night owl and the majority of my training happens later in the day. Though if two runDisney races in the past six months had prepared me for anything, it was an early start. Pharrell Williams faded out in preparation for the national anthem, of particular significance on this Memorial Day weekend. Per my usual modus operandi we’d arrived 15 minutes earlier, and as “The Star-Spangled Banner” drew to a close I squeezed into the restless start corral and scooz-me-thankoo’ed my way toward the sub-4:00 pacers grouped near the front. I reached my mark with perfect timing, just as the starter’s countdown reached zero and the stampede of lithe human cattle charged forward – away from our final destination in Ventura. The first mile+ would be a nice flat out-and-back along East Ojai St (seemingly Ojai’s “main drag”), during which I’d focus on settling in and not flying off the start line like a Walmart shopper on Black Friday. My target was roughly an 8:00/mile pace for the first three miles. This would be my first PR attempt of the year, and unlike my only other 2015 marathon, I wouldn’t be making 19 photo stops along the way. All my training for the past four months – the regular 60+ mile weeks, including a 31-day stretch in March/April during which I totaled 285.5 miles – had been focused toward this day, and toward securing a no-doubt-about-it Boston Qualifier time after two admittedly disappointing 2014 attempts in Berlin and at the California International Marathon (CIM). Without rehashing The Rime of the Boston Qualifer from my Berlin post, I’ll say that with an official age-group qualifying time of 3:25, I needed to escape the near-miss purgatory in which I found myself after a 3:24:14 in Berlin and a 3:24:15 in Sacramento. With that in mind, my goal for the morning would be a sub-3:23, and the closer I could get to 3:20 the better. Falling in step with the herd of happy runners (Pharrell had done his job! ), I felt far removed from my most recent PR in Berlin. 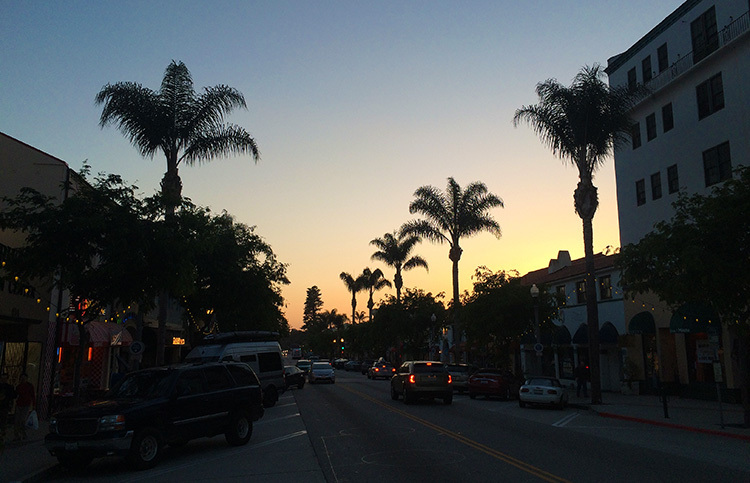 Ojai is very much a laid-back hippie/artsy mountain town, lying as it does just south of the group of peaks known as the Transverse Ranges. It’s a Shangri-La kind of place that attracts groups of bikers looking for a convenient rest stop between long stretches of open road, and where “LIVE BAIT” signs dominate convenience store windows. Thanks in part to the 6:00am start time, the morning’s weather looked to be cooperative. Granted the SoCal sun would quickly have its way with the overmatched clouds, but starting temperatures hovered in the mid-50s, and the route from mountains to beach promised frequent shade. As a bonus, the ocean headwind would be a non-factor early in the day. Weather is always the single biggest variable with the potential to spoil the best-laid plans on race day. So this was a good sign. Further helping my cause would be the course itself. Mountains 2 Beach is one of California’s most celebrated Boston Qualifying races, meaning every year a high percentage of its finishers qualify for Boston. This quickly becomes a self-fulfilling prophecy, since runners on the cusp of qualifying for Boston tend to seek out races that offer the highest odds of success, which in turn leads to a high percentage of BQ finish times and enables the race to market itself as “BQ friendly” to the next year’s flock of BQ hopefuls. Before I’d run a single step through Ojai, I was a big fan of Mountains 2 Beach. Granted it was already on my short list of must-run SoCal races, but even so, everything leading up to race day appealed to me – from the just-right number of pre-race emails, to the tiny low-key outdoor expo at Ventura High School, to the much-appreciated lack of in-your-face social media (including no Twitter handle). Luckily those few seconds would be the only crowded moment on the course, and the only time all morning I’d have to work to circumnavigate anyone. 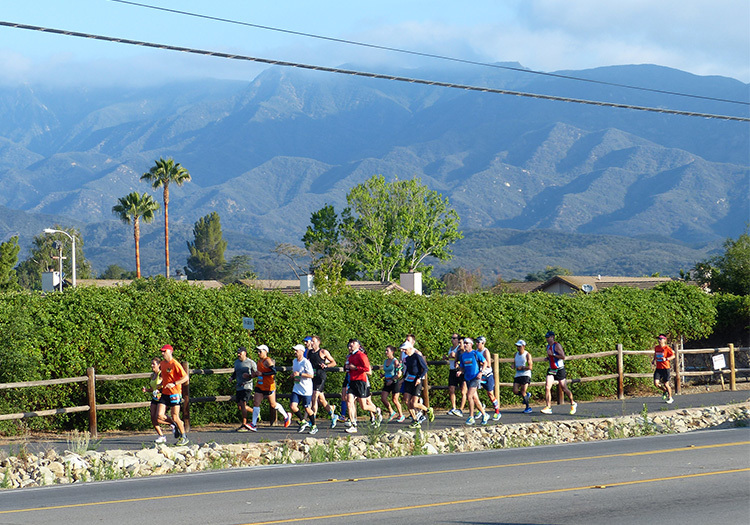 Notably, M2B is the only race I’ve run where the bystanders may have been faster than the runners, as the number of spectators sporting Boston Marathon shirts and jackets on this day would make Ojai & Ventura feel like Boston West. 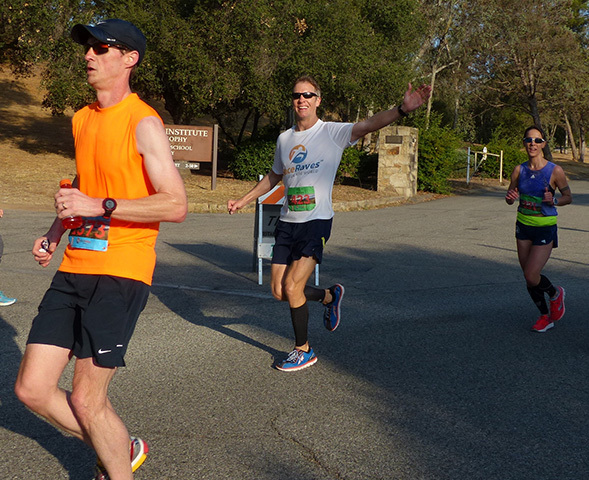 It turned out our first visit to the Ojai Valley Trail would be more of a sneak peek, since just before mile 5 the course looped back for a 4-mile tour through the residential neighborhoods of Mira Monte, Meiners Oaks and Ojai. This peaceful stretch contained the only advertised “uphill” on the course, a gradual 160-foot rise between miles 5 and 7 with two sharp jags thrown in that hardly registered on my Garmin, and which were immediately followed by equivalent descents. Though I’m not much of a downhill runner, the upcoming descent would be gradual enough that I intended to take full advantage, to find out just how fast I could get to Ventura. I also knew that by the time I reached Ventura at mile 22, I’d be facing 4+ miles of largely exposed beachfront running, with the sun already high in the sky. So I intended to do as much damage as possible (to both the course and my quads) over the next 13 miles. 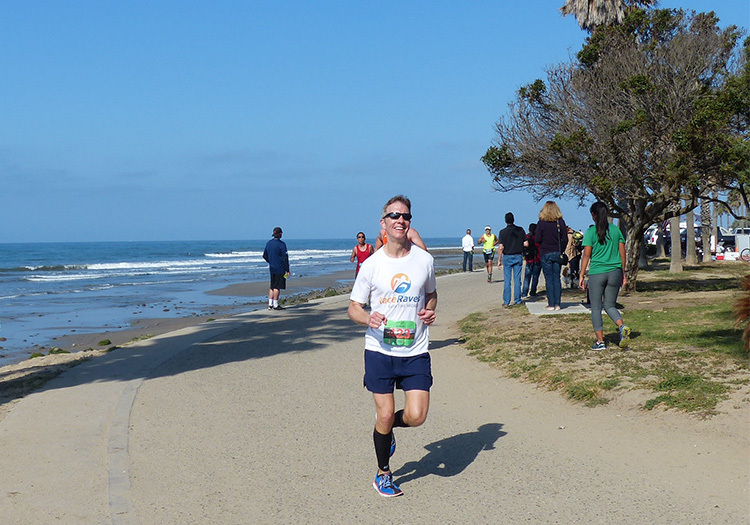 Over the 26.2 miles you will see beautiful mountain peaks, the Ventura River Basin tops of your shoes and the backs of other runners, the gorgeous Ventura Promenade, and the world renowned Ventura Coast line. In reality, the paved trail from Ojai to Ventura follows a pleasant but relatively nondescript tree-lined route past sun-charred grasslands and fenced-off industrial yards, punctuated by a smattering of commercial zones and the occasional playground or RV park. 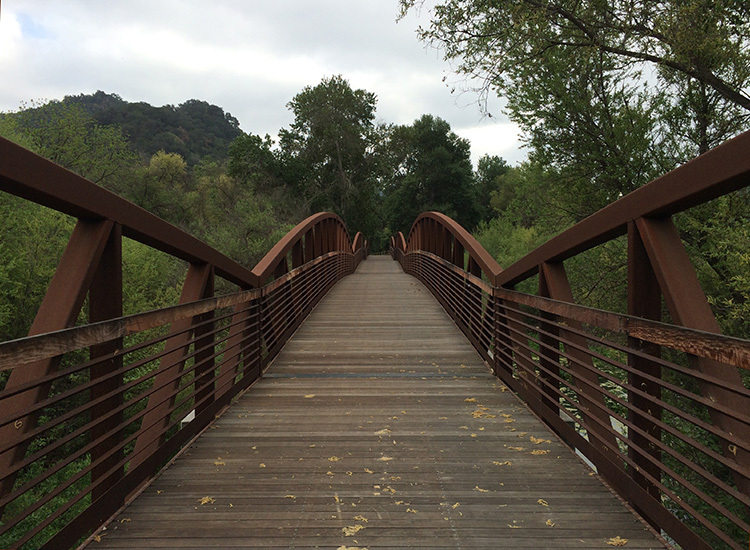 The highlight of the 13 miles was the quaint arched wooden footbridge over lethargic San Antonio Creek, which apparently connects with the Ventura “River” (a term I use generously, in the face of California’s ongoing drought). My preparations for M2B had included a training first: pre-race reconnaissance. I’d actually run 20 miles of the course back in March, including the entire stretch along the Ojai Valley-turned-Ventura River Trail to get a feel for the descent. So having been here and seen the sights before, I was content to keep my head down and power forward with the 3:13 pacer far ahead and the 3:23 pacer (hopefully) at my back. One key change to my training cycle this time around had been a focus on fine-tuning my race-day nutrition, to help me push through the inevitable Wall and minimize the post-mile 20 lethargy I’d experienced at Berlin and CIM. My M2B strategy would be to carry six unwrapped Clif Shot Bloks in each pocket and munch one religiously every 15 minutes – perfect timing for a sub-3:30 marathon, and a rate of intake I knew my stomach could handle. Gels are more difficult to access and dispense, like trying to squeeze (and eat) the last of the toothpaste from the tube while you’re running. I realize there are gel dispensers you can buy to avoid this step, but rarely do I see non-ultrarunners carrying one. On the other hand, pop a Shot Blok in your mouth and it smoothly dissolves over the course of a minute or two, without your looking like you belong in an Oatmeal cartoon. Gels are messy, have the consistency of gritty paste and leave your fingers stuck together… which is great if you’re trying to relive those nostalgic “toddler years” mid-race. Gels inevitably require water to choke down, unless you’re a camel (despite consuming 12 Shot Bloks, I needed only two gulps of water during the race). Gels require more packaging since calorically speaking, two gels = one package of Shot Bloks. So if you can offer up a legit defense of gels over Shot Bloks, I’d appreciate your enlightening me in the Comments below. Otherwise, I’ll assume that running 26.2 miles by itself isn’t enough of a challenge for you. Just before my next Katie sighting at mile 16, I fell in step with a group of three fellows (two may have been brothers) who clearly knew other and were cruising along at a 7:30-7:35/mile pace. For the next 5 miles theirs would become my ideal “Goldilocks” pace: not too slow, not too fast, but juuust right. It was nice to let someone else worry about pacing for a while. Like a bulky sweatshirt, the sense of humor is one of the first items to be cast aside during a marathon. With me lagging slightly behind to avoid the chatty fellow’s stabs at conversation, our foursome remained in lock-step until about mile 20. At that point Chatty dropped off the pace and the other two began to pull away to varying extents, until by mile 23 we were strung out in a line of three, each trailing the fellow ahead of him by about 20 seconds. 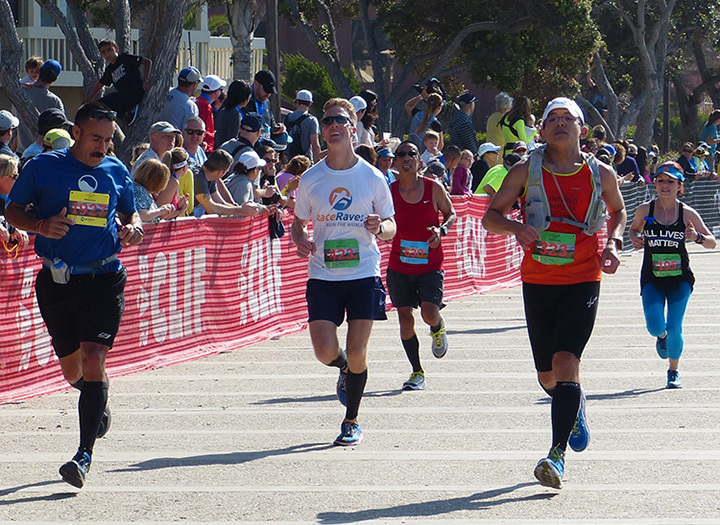 Not surprisingly, the persistent downhill had a similar effect as all my stops and starts at January’s Disney World Marathon: by the time we reached sea level at the Ventura Promenade in mile 23, my upper quads (i.e. the muscles that lift my legs) were pretty much shot. I saved one last smile for my final Katie sighting in mile 23, then put my head down and motivated myself forward by imagining the 3:23 pacer gaining ground behind me. Nothing like a healthy dose of self-imposed fear to liven up the final stages of a marathon. With my quads in imminent shutdown mode, my stomach – damn their proximity, they must have been talking! – began its own discomforting protest, and I tried to ignore its belly-aching while willing myself forward one stride at a time. Clearly a sub-3:20 finish was a goal for another day – right now it was time to salvage every precious second I could. Einstein’s “pretty girl” is the first four miles of the marathon; his “hot stove” is the last four. Likewise, one truth always strikes me as I grit my teeth through the brutal finalé of every marathon. You can be the most chiseled triathlete or the doughiest first-timer; you can sport a buzzcut-with-visor-&-Oakleys or the most wildly uncoiffed mane; you can boast a tapestry of Ironman tattoos or perfect blemish-free skin. At mile 24 of a marathon, none of it matters. Because by that point, EVERYONE is suffering. And we’re all in it together. The marathon is all about equal opportunity discomfort, and aside from death it may be the next great leveler. No doubt ultramarathoners feel the same about their distance of choice. Finally, though, I heard them – surf angels singing on high as I reached the final right turn back onto the Ventura Promenade and the mile+ home stretch. In the distance the finish line beckoned impatiently. By now the direct sun was starting to take its toll, and I was amazed at how completely unable I was to pick up my pace. No más, pleaded my quads. I imagined I could hear the thundering footfalls of the 3:23 pacer charging up behind me. Somehow I summoned one final surge past another struggling runner before jubilantly crossing the finish line to the familiar sound of the race announcer butchering my last name over the PA. And “Shwopokowsky” never sounded so good. I’d beaten the 3:23 pacer to the finish, and my Garmin looked mighty handsome sporting its shiny new PR time of 3:22:07, nearly three minutes inside my official Boston Qualifying time. Granted nothing’s certain until Boston registration opens in September, but just to be safe I’ve cleared my schedule for Patriots’ Day 2016. For now, though, it was time to celebrate. I thanked the friendly volunteer who hung the medal around my neck (what’s up with finishers who grab the medal and carry it? ), then turned back toward the finish to soak in the moment and several more just like it. Never before had I heard so many exuberant whoops and joyous shouts in a finish chute, as newly minted Boston Qualifiers laid bare their raw and exhausted emotions with friends & family. Those, of course, were the lucky ones – I also witnessed two runners cross the finish line and immediately collapse into the arms of their fellow runners, who lent a shoulder and escorted their seemingly incoherent mates (hopefully) to the nearby medical tent. 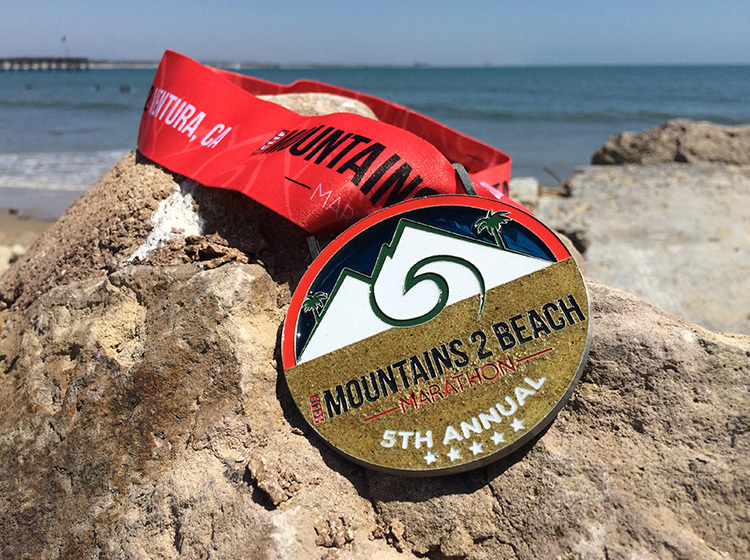 Boston excepted, Mountains 2 Beach is a finish line like no other. Then I located Katie – never far away, to be sure – and wrapped her in a huge n’ sweaty hug, as we confirmed that neither of us had plans for next April 18. Turns out she’d scored her own PR at M2B, showing up at EIGHT separate locations along the course. Sure, one of them had been a Starbucks across from the Ojai Valley Trail where she could comfortably view the course and watch me pass, but still… the Quicksilver kid in the new Avengers movie had nothing on her. She was everywhere. 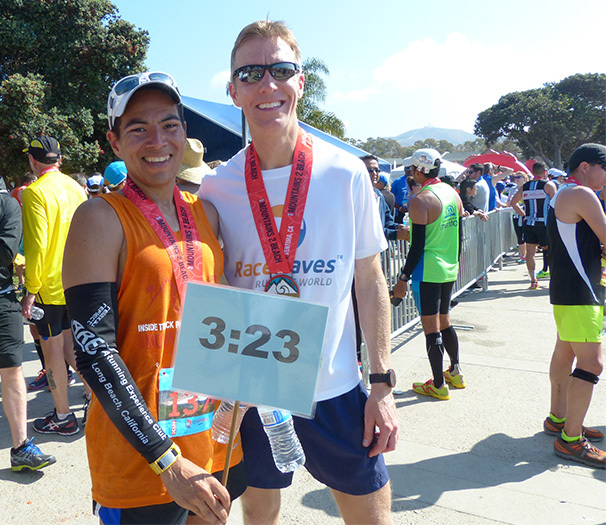 I thanked Gil the 3:23 pacer (who’d finished in 3:22:47) for keeping me motivated, and learned he’s also the VP of my brother’s running club down in Long Beach. Then we caught up with Race Director Ben Dewitt and congratulated/thanked him for producing a brilliant race that his finishers (passed-out guy on the stretcher maybe excluded?) clearly enjoyed. And I made sure to ring the Boston Qualifiers gong he’d set up for the occasion, a much more satisfying exercise than the BQ bell I’d rung after my 3:24:15 at CIM. My biggest enemy at M2B turned out to be not so much the long downhill itself – had the finish line awaited at the end of the Ventura River Trail, I might have had a legitimate shot at 3:20. Rather, trouble arose when my used-up quads transitioned from 13+ miles of faster downhill to 4+ miles of flat. Though I understood in theory the perils of downhill running, still I underestimated its cumulative effect on my cadence over those last 4 miles. My legs simply refused to turn over anymore. Katie returned from feeding the parking meter to find me sprawled out on the warm beach, reveling in my best Personal Best yet. The crash of aggressive surf taking out its frustrations on the shoreline filled one ear, while the squeals and whoops of excited finishers filled the other. At that moment, I could easily have fallen fast asleep right there on the sand. And the only sound missing was “Happy”. BOTTOM LINE: Mountains 2 Beach is an all-around awesome race, and one of the gems of the California marathoning scene in only its 5th year. Based on the laughter and smiles at the post-race festival, Boston hopefuls and non-hopefuls alike enjoy this event. With its fast and spectator-friendly course, first-rate production and laser-like focus on helping its runners qualify for Boston, M2B very much strikes me as CIM with warmer temperatures and better scenery. The race perfectly complements its low-key venue. The outdoor expo at Ventura High School was easy and quick to navigate, though late arrivals on Saturday should expect a bit of a wait to collect their number. Apparently there was a pre-race pasta dinner available for $10 at Ventura High, though given my experience in Alabama I figured the night before a PR & BQ attempt would be a bad time to poke the bear. Whereas many races give lip service to their runners while bending over backwards for their sponsors, Mountains 2 Beach in every way feels like a race organized by runners, for runners. Admittedly I’m pleased I could support the title sponsor (Berkeley company Clif Bar) with my choice of race-day nutrition. And reinforcing the “by runners, for runners” vibe of the weekend, the decision to have pacers run at two minutes under their official Boston Qualifying times was a genius call. 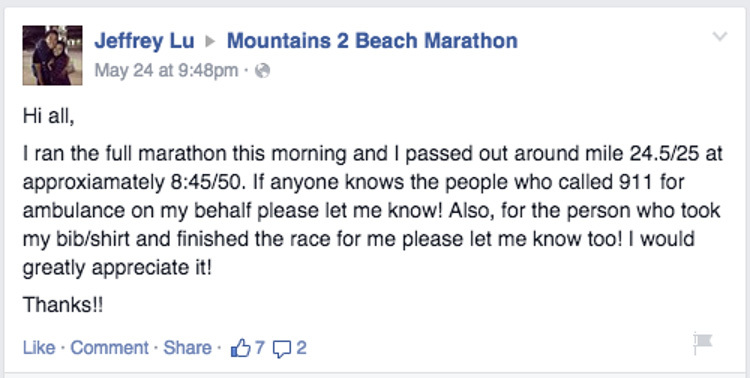 PRODUCTION: I loved the “show up, run fast” mindset at Mountains 2 Beach. If you favor low-frills yet extremely well-produced events that finish alongside the Pacific Ocean, this is your kind of race. If, on the other hand, you prefer screaming spectators and raucous on-course entertainment, you’re likely to be Ojai-ly disappointed. Despite the fact that I tend to ignore aid stations and only grabbed two quick sips of water at M2B, there seemed to be plenty of aid stations serving both water and Fluid, the electrolyte drink of choice. The name “Fluid” made me smile, sounding as it does like the ambivalent beverage equivalent of Soylent Green (though I doubt Fluid is people). Luckily my innards behaved, since bathrooms along the course were few and far between. If there were porta-potties I didn’t notice them, and the only facilities I remember were the public units in Foster Park near mile 16. The cozy post-race festival in Promenade Park included more sponsor tents than the pre-race expo plus a beer garden, Boston Qualifiers gong, massage tent, medical tent and stage featuring a live band, all conveniently encircling an open grassy area where runners basked in the SoCal sun and their post-race glow. All in all, a very nice arrangement. SWAG: The race tee was a simple gray Greenlayer technical tee that, like other Greenlayer apparel I own, doesn’t fit particularly well. The finisher’s medal, though, makes up for its less swaggy cousin with its attractive part-metal, part-stained glass design. And I’d swear I can hear the ocean when I hold it up to my ear. Congratulations on qualifying for Boston! Make your hotel arrangements ASAP. Rooms book up quick and they are $$$$$. Thanks Rob, look forward to joining you next April! Mountains 2 Beach certainly wasn’t Big Sur in a stiff headwind, but I’ll take it. And I appreciate the heads-up… we have indeed begun the hunt for affordable lodging, though now we need to bear down and get ‘er done before qualifying starts to look like the easy part of the process. Congrats on the run. Agree 100% with the gel comments issue but as far as your medal hanging question – a dissenting opinion. As I near 50+ marathon completions (will finish 50 later this year) I find that my goal is always to complete the marathon. I am long past trying to meet my Boston times and rate my marathon run whether or not I am 10 to 15 minutes within my personal goal (set that morning based on my pre run toilet). So basically I am running for my own personal goals and health. When I finish I just want to grab my medal and a banana, change into dry clothes, head home and get in the hot tub. Walking around with my medal around my neck is the least of my concerns. I finished and I know how I did so that is what matters. Thanks for reading Jeff, and appreciate (as always) the contrarian view. 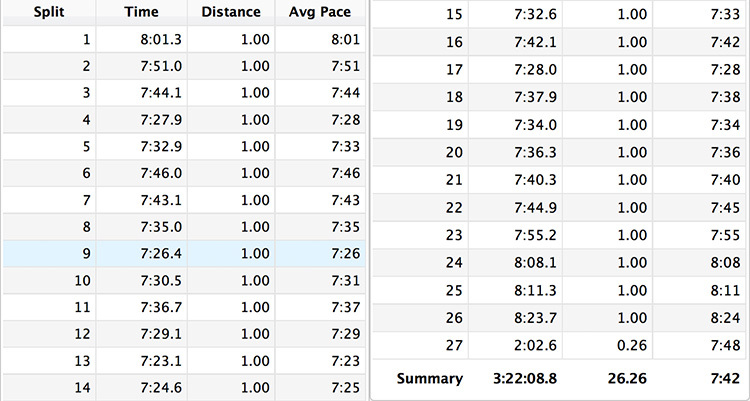 Though Boston’s been on my radar for a while now, I only started training seriously in the past year, since the < 3:15 time I would have had to run back in my leaner, meaner days (i.e. before I became the roly-poly sweetheart I am now) would have been a serious stretch. But with Boston 2016 adding 10 minutes to my BQ time, the “skill level” and “age group” curves on my BQ graph finally intersected, so now’s my best shot at making that my 4th World Marathon Major. And since we ran Berlin & NYC together, it seems only fitting that you ramp up your training so we can meet in Boston next year as well. Don’t break up the band! BTW, if Boston’s not in your 2016 plans then you and Susan should enter the Big Sur lottery, since that’s the following week and I’m targeting the Boston 2 Big Sur Challenge as well. And I know Big Sur’s a regular stop on the Marathon Tours world tour. Congratulations on notching your best and third Boston qualifying time! Mountains 2 Fast 2 Furious sounds like a race made for you — as few bells and whistles as possible, curated for the serious runner and with a keen eye for details. I agree that having pace groups with REAL BQ times as opposed to theoretical ones is a masterwork in catering to the diehard crowd. What good is the Q if you can’t R? Maybe “BR” is the next term to hit the running community. I’m a GU dude mostly because it was the first mid-race nutrition I tried and I tend to stick with things. Sauconys were the first pair of shoes I bought on my own, so I’ve worn them for six years now. UnderArmour was the first real apparel I wore when I began seriously training, so they’ve been my exclusive shirt provider. I bought a Garmin five years ago, so I’ve stayed with them. It’s not so much brand loyalty as it is, to stick with the GU theme, stickiness. It’s much easier to stay with something you’re familiar with. Plus, I don’t like chewing my food when I run. As for the medal situation, I usually finish races drenched in sweat, so I don’t want to stink up the ribbon. I wait until I air dry or at least change. Sounds like you have a summer of drills, drills, drills, hopefully to a smooth fall season and a big time goal at CIM. Like Otter in 2012, whose 3:43 then-PR was far too close to my 3:39, your recent marathon times inspired me to throw down the hammer. So if you end up killing it at CIM, know that you’re pushing more than one person. I cannot tell a lie… if a solid BQ was priority #1 and 2, then eclipsing your Indy marathon time was easily #3. Just squeaked by, but feels good to be back within slingshot distance of your PR for now. And I appreciate your loaning me second place until you floor the accelerator again in September. As a runner with legitimate OCD potential, I can appreciate not breaking something that ain’t broke. Though I also figured having to chew the Shot Bloks would get annoying, I’ve found they dissolve to the point that I don’t have to chew ‘em as much as just gum ‘em a couple of times to finish the job. Don’t know whether you’ve considered testing them out on one of your longer training runs, but not having to deal with the hassle could save you time & not disrupt your rhythm in Berlin. Hmm, interesting perspective on the medal. I’m not a real sweaty guy, but I can see how that could get messy. Sounds like they need to start making the ribbons out of the same wicking material as the t-shirts. And I absolutely agree with your idea of a BR time, either that or they tighten the BQ times yet again. Maybe the BAA can offer “virtual” unicorn medals to anyone who hits their BQ, while those who hit their BR time actually get to run the race? Nobody in the days of Rodgers & Shorter could have predicted running would get this complicated. And until I’m looking at my official BAA confirmation email in September, I’ll have to deal with the nagging-yet-not-overly-rational concern that something will happen to wildly skew all of this year’s BQ times, causing my cutoff to fall closer to a “pedestrian” 3:20. Ah, CIM… at this point it’s more Siren song than locked-down plan. There are several other races I’d like to run between now and then, and more importantly I haven’t decided yet whether I want to dedicate another full training cycle to it. But I do like testing my limits at the marathon distance, and the lure of qualifying for Boston 2017 (whether I run it or not) is tempting. Thanks as always for the support, Dan! As for Bloks vs. Gu — I use both, mostly to shake things up. There are some flavors of Gu that I actually like, and I’ve gotten pretty proficient at opening, ingesting, and discarding them while running. However, taste and texture-wise, I prefer Bloks, but I have a hard time eating them when I’m trying to run faster. I might try your method of gumming it. That should read “BQ-worthy” not “worth”. 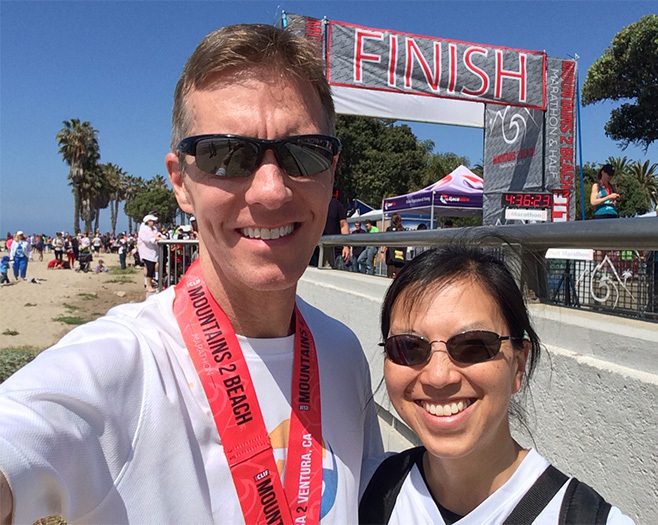 Thanks, Jen… given our shared affinity for CIM, it crossed my mind more than once that you’d like this race. No big buildup to race day, no crowded expo (if <10 tents can be called an “expo”) and minimal on-course congestion… nothing to distract from the actual race. Plus it’s a fairly easy car ride from the Bay Area. 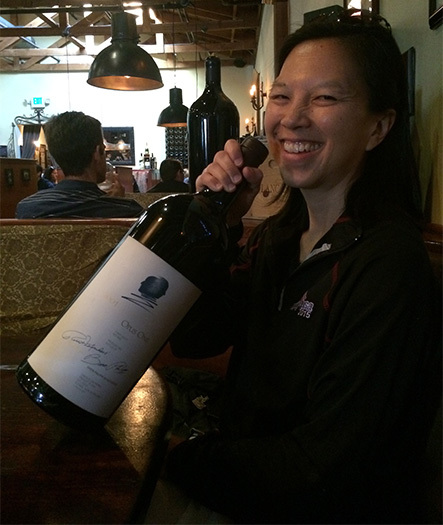 Definitely one to keep in mind for your next CA road marathon. Kudos to you for mastering the Gu packaging while running. Not only is the process for me like extracting the last bit of toothpaste from the tube, but like toothpaste I always timed my intake to ensure there was water readily available. Which quickly became too much for my hazy runner’s brain to handle in the middle of a race. Ha, thanks Rachel, looking forward to your sexagenarian Boston debut… better late than never! And yes, it definitely helped to be surrounded by similar crazy-eyed BQ wannabes willing to leave a kidney on the course for their shot at Boston 2016. Unfortunately for our previously chummy PRs, Dan found his “turbo” button at Fargo… so if by “uber competitive” you mean “Mike would need to hail an Uber ride for a mile of the race to stay competitive”, then yes we’re running neck and neck! Have fun in Boston! It is going to be great and maybe I can jump in and run a few miles with you. I like gels because eating a Blok that has been in a sweaty pocket in my shorts for 2 hrs is unappealing to me. How did you manage to carry 12 Bloks? And I wonder if your stomach problems at the end had anything to do with the Bloks. I am sure Gil can get you in in under 3:20 next time. That whole “jump in and run a few miles with you” may have worked well for us in ’01, but show me a spectator who tries that post-2013, and I’ll show you someone whose family is bailing him out of jail later that day. Sad but true. Another good point about the Shot Bloks: my pockets didn’t sweat significantly, only the waistband of my shorts, so the Bloks (6 per pocket) stayed dry for the entire 3 hours. If you’re a super-sweater then that could be an issue, but the pockets in most running shorts these days are designed to stay drier than the shorts themselves, which I made sure to verify before race day. And even if the Bloks were to get sweaty, isn’t that all part of the natural water cycle anyway? Still beats gritty pasty gels! Ha, are you offering Gil as my personal pacer for the next PR attempt? Has he been informed? And what’s his hourly rate for a 3:20 marathon? Congrats on qualifying for Boston with a time that should pretty much guarantee that you’ll be able to register. I’ve been following your journey on your blog for a while now and your progress as a runner has been phenomenal. I do hope the weather holds up for the 2016 edition of the famed jaunt that begins at Hopkinton. On the fueling note – my personal preference is for gels rather than shot bloks. I find the bloks hard to chew and the gels easier to swallow. Pretty much sticking to what works now, as you pointed out in one of your responses. Thanks for reading and for the kind words, Krishna. I enjoy your comments & ever-changing finisher’s medal avatar on Dan’s blog, and admittedly I’ve clicked on your name a couple of different times hoping to find a blog behind the link. Someday? Mountains 2 Beach was a great feeling… now I need to refocus and decide when and where to take my next PR shot, since I don’t yet have that North Star to guide my training as Dan has with Berlin. Maybe later this year, but right now I’m letting myself look forward to next April 18. Cold & rain I can handle, but I’ll be wishing away the headwinds. Continued success with your own running! I do pen race reports pretty regularly and I’ve thought about blogging, but have lacked the discipline to start and maintain a blog. As you say – someday, perhaps. You will very much enjoy your first Boston marathon in 2016, regardless of the weather. In fact, you’ll enjoy the whole process. The application, confirmation of acceptance, picking up your race packet at the shoulder-to-shoulder expo, getting up super early for the bus ride to Hopkinton, the wait and anticipation at athlete’s village for your wave (you will most likely be wave #2 that starts at 10:25 am), queuing up at the start line with everyone else who qualified with a time similar to yours, runninga course like no other, the overwhelming emotion of crossing the famed finish line at Boylston, and being festooned with the famed unicorn finisher’s medal by the fantastic volunteers – all make for a memorable experience. As many people will tell you – the first 16 miles are mostly downhill and it’s easy to run very fast unless you’re disciplined at pacing yourself. Miles 16-21 are the famed Newton hills, which are not particularly steep or long, but come at a point in the race where your quads are likely to complain. Miles 21- finish are mostly downhill and you’ll pay the price during these miles if you’ve gone too fast in the first 16. 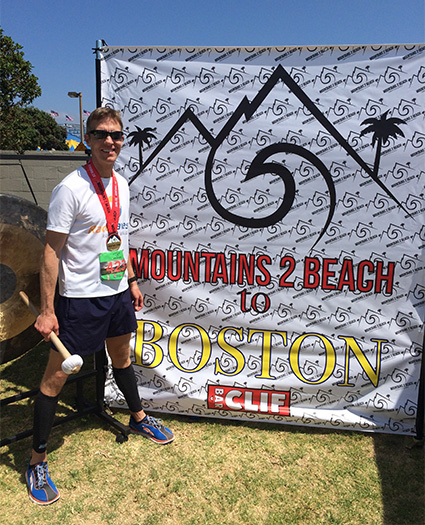 The downhill running that you did for Mountains2Beach is great practice for Boston. You should go out and do some shorter races. For me at least, PRs is shorter races have always come after marathon PRs. Happy running ! Totally understand not wanting to maintain a blog… it’s become increasingly tough for me to write with any regularity since we’ve ramped up our work on RaceRaves. Speaking of which, we’d love to welcome you as a member and host your race reports (as reviews) on the site, since clearly you have a lot of great experiences & valuable insights to share with other runners. 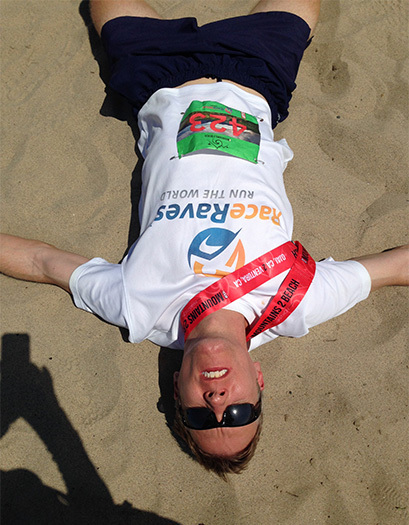 I’ve had similar PR experiences as you, with my current half marathon PR coming at Oakland in 2012, one week after running my then-PR at the LA Marathon. I would have followed a similar strategy this time but for other obligations – and actually, I had my sights set on a local 5K before race day dawned at 80°F. And with the heat being magnified by the blacktop raceway on which the race was held, I chose to save my $30 for a cooler day.